This is a fun trick to learn how to shift more weight forward over the solid foundation of your arms and lift up into full handstand from Tittibhasana. The gluteal family is composed of the gluteus maximus, gluteus medius, and gluteus minimus. When the glutes and hamstrings engage—particularly the lower fibers of the gluteal msucles near the hamstring insertion—they extend the hip-joint. 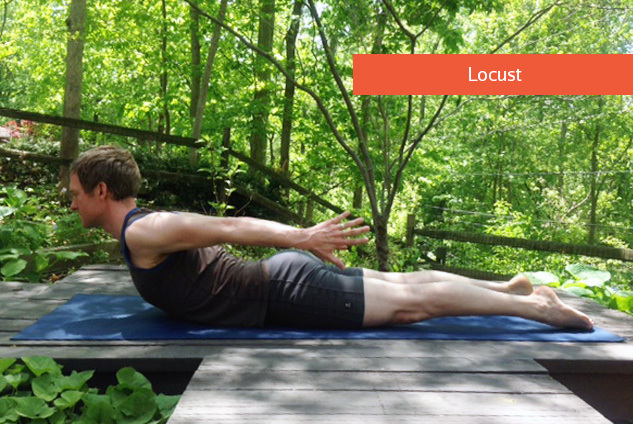 This motion initiates all backbends and helps keep the pelvis and spine congruous. Gluteal engagement also helps fire the paraspinal muscles and stabilizes the sacro-illiac joint—both of which facilitate pelvic and spinal balance in backbends. But, let’s answer the question with a little more nuance since some backbends are enhanced by gluteal engagement and others are not. Prone backbends like Locust Pose and Cobra Pose probably don’t benefit as much from gluteal contraction because the weight of the pelvis rests on the floor during these postures. This means that you don’t need gluteal strength to lift the pelvis because it’s not moving in the posture; you also don’t need the stabilization that the glutes provide because the pelvis is supported by the floor. In kneeling backbends like Camel Pose and supine backbends like Bridge Pose and Upward Bow Pose, gluteal engagement is more helpful. These postures produce a greater degree of spinal extension so it’s even more important that the pelvis and spine move cohesively. Engaging the glutes, particularly the lower fibers of the gluteus maximus near the hamstring insertion, will help maintain this balance rotating the pelvis slightly back over the top of the legs. This will help reduce lumbar compression—the feeling of your lower-back “crunching.” Even more, the glutes help lift the weight of the pelvis in supine backbends. If you don’t use the glutes in these postures, it’s more likely that you will unnecessarily burden less efficient muscle groups. Some teachers and students are concerned that using the glutes will make the knees splay too far apart. This is a legitimate concern, but it’s easily managed. All you have to do in this situation is co-contract the muscles that line the inside of your thighs, the adductors. Firing the adductors while you engage the glutes will keep your thighs nice and neutral. In yoga, we have a love affair with internally rotating the legs. Down dog: turn the legs in. Standing forward fold (uttanasana): turn the legs in. The list goes on. It goes to the point of where internal rotation of the legs is seen as a panacea–a cure-all for aches, pains, misalignments and imbalances– and external rotation of the legs, as a consequence, is seen at best as mostly undesirable. The reality, as always, is quite more nuanced than that. Simply mechanically turning the legs in, which in my opinion has little to do with the muscles of your inner thighs (also known as the adductors), produces a bunch of unintended consequences. Further, simply turning the legs in like that, from the outside if you will, strains and compresses the femoral triangle–home of the femoral nerve, femoral artery, femoral vein, femoral ring/canal (lymph nodes, drainage). 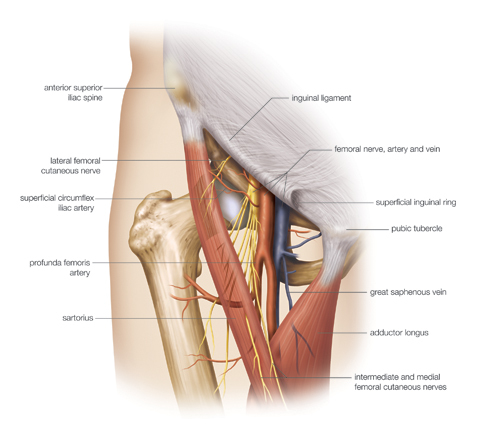 The femoral triangle is basically the armpit of the thigh. Its boundaries are: the inguinal ligament (your hip crease from hip point to pubic bone), adductor longus (one of inner thigh muscles), and the upper portion of the sartorius (from the hip point to where it meets the adductor longus on its way down and in to the inner knee). Some of you will say that it’s not about turning the legs in (and it definitely isn’t), but about taking the inner thighs back. I don’t disagree. But I would venture to say that when most people hear the instruction to take the inner thighs back, they will turn their legs in from the outside like I described above. In other words, they will simply internally rotate their legs. It’s quite a bit more subtle than that. The inner thighs activate from the ground up, more specifically from the lift of the inner arches of the feet via the tibialis posterior muscle. So, for example in down dog or uttanasana, with the feet on straight and about hip width apart, draw from the balls of the feet back towards the high point of the arch right in front of the heel and lift that energy up into the inner thighs and the core of the pelvis. Then, ground down through the outer heels without losing the lift of the arches and resist the inner thighs away from each other without changing the position of your feet/heels. The pit of your belly will probably hollow out and lift by itself, your low back will feel broad and supported, and your hips won’t grip. You imagine a spinning top. Stillness is like a perfectly centered top, spinning so fast it appears motionless. It appears this way not because it isn’t moving, but because it’s spinning at full speed. Stillness is not the absence or negation of energy, life, or movement. Stillness is dynamic. It is unconflicted movement, life in harmony with itself, skill in action. It can be experienced whenever there is total, uninhibited, unconflicted participation in the moment you are in – when you are wholeheartedly present with whatever you are doing. He went on to say that if you just get up, put on your yoga clothes and stand on the mat, you’ve accomplished something. What naturally tends to happen is that once on that mat, you figure you may as well do the sun salutations which lead to the standing series and then a few sitting poses—and it just keeps going. Sharing this piece of advice through his gentle, humble and kind demeanor, David’s message stuck for me. Just show up. Seems simple. In what other areas of life can this be applied? Communication with your spouse is currently challenging. Just show up; keep trying to find ways to understand one another. You’ve just finished eating a donut at a meeting while you’ve pledged to a new diet. Just show up; from this moment on become more mindful of your snack choices. That project, book or blog post didn’t get the feedback you anticipated. Just show up; keep working at it. If there’s passion behind what you do, it will get noticed. I don’t expect those days when I just “don’t wanna” will vanish. It’s very human to have lapses in motivation. But having the intention of moving forward—of rolling out the yoga mat, so to speak—is the first step that may lead to more.